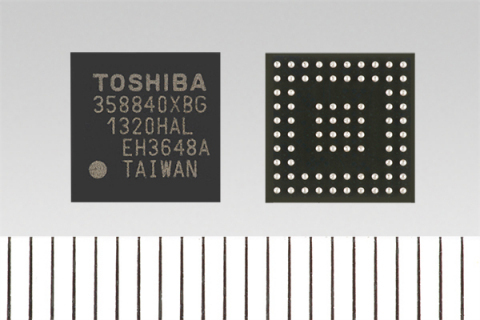 TOKYO--(BUSINESS WIRE)--Toshiba Corporation (TOKYO:6502) today announced the launch of “TC358840XBG”, the industry’s first1 interface bridge IC that converts 4K ultra HD video stream from HDMI® to MIPI® CSI-2 without compression and deterioration. Sample shipments will start in April, with mass production scheduled to start in September, 2014. The new IC splits 4K ultra HD (3840 x 2160) video stream into the left and right images, and outputs from dual MIPI® CSI-2 interfaces. It supports conversion of high resolution 4K ultra HD video at 30 fps, contributing to high quality video processing. The IC also supports conversion of HDMI® audio input stream to I2S, TDM, or MIPI SLIMbus® (Serial Low-power Inter-chip Media Bus), allowing use in a wide range of applications. 1. As of March 17, 2014. Survey by Toshiba Corporation. * MIPI and SLIMbus are registered trademarks of MIPI Alliance, Inc.
Toshiba launches "TC358840XBG", the industry's first interface bridge IC that converts 4K ultra HD video stream from HDMI(R) to MIPI(R) CSI-2 without compression and deterioration.